Published: Nov. 5, 2012 at 04:27 a.m.
(3:11) (No Huddle, Shotgun) M.Hasselbeck pass short middle intended for D.Williams INTERCEPTED by B.Urlacher at TEN 46. 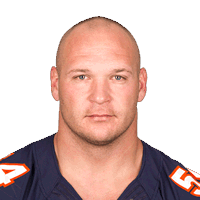 B.Urlacher for 46 yards, TOUCHDOWN. Published: Nov. 5, 2012 at 03:48 a.m.
(14:54) M.Hasselbeck pass deep middle to K.Britt to TEN 43 for 23 yards (C.Tillman). FUMBLES (C.Tillman), RECOVERED by CHI-B.Urlacher at TEN 46. B.Urlacher to TEN 46 for no gain (K.Britt). Published: Nov. 4, 2012 at 02:00 p.m.
Tennessee Titans quarterback Matt Hasselbeck is picked off by Chicago Bears LB Brian Urlacher for a 46-yard TD return.